Travertine Restoration can involve hole repairs, crack repairs, grout repairs prior to honing to remove scratches and finally polishing to the desired finish. Your CENTURY STONE trained craftsmen can provide a customized estimate based on your floor, and your floor needs. Call us today, or click on the Estimate Request link to submit your information. 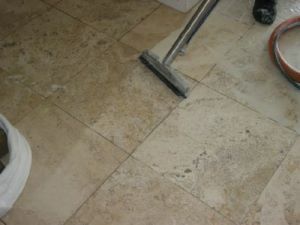 WE CAN CLEAN, POLISH, REPAIR AND PROTECT YOUR TRAVERTINE. The beautiful and varied structure of travertine can require special maintenance care associated with its porous structure. Whether seeking to re-polish your surface to remove wear and scratches, or filling and repairing chips, cracks and holes, CENTURY STONE can restore your floors, walls or counters to their original beautiful appearance. Have an open travertine? As rustic and beautiful as this stone can be, it is not uncommon for frustration to settle in regarding how to keep it clean. CENTURY STONE offers several alternatives. In house power-washing with a built-in vacuum allows cleaning to penetrate deep into these open areas and then vacuum out the dirt and cleaner solution in a single water controlled step. See those islands of cream in your travertine? These are the factory filled areas of porosity in your travertine or saturnia. CENTURY STONE can replicate this as needed. So, when a "hidden porosity bubble" cracks open we can repair this so it looks like it never happened. Does your newly installed travertine floor have an uneven finish? Believe it or not, tile coming off the commercial polishing lines will often display subtle differences in finish. These differences can materialize on your floor as tiles or areas of high and low finish. CENTURY STONE can quickly correct this situation for you, delivering the even finish you sought when your floor was first installed. CENTURY STONE can help here as well with our TRAVERFIL services. Open areas are filled with a concrete or epoxy based fill system color matched to blend with your stone. The fill is then honed level (unless a dimpled appearance is sought in an effort to maintain some of the rustic appearance of the open stone), and polished to the desired finish. The net result is an easier to maintain floor. While a stone product, travertine is considered a soft stone, taking wear or minor scratches as sand or dust is ground underfoot. Often appearing as a dull spot, or, wear pattern these areas can be honed and polished to deliver the finish you desire, whether a soft and subtle matte, semi-gloss, or luxurious gloss finish. Restored properly your floor is scratch-free with a beautiful finish. CENTURY STONE starts the process with our honing treatments to eliminate wear and micro-scratches, after which it is polished to an even, beautiful finish.